codeBeamer ALM's new Review Hub was one of the major features introduced in our Application Lifecycle Management tool's latest version 8.1. Our users love the way codeBeamer simplifies the reviewing process and makes compliance audits easier to tackle, but some of them had ideas on how to further improve this set of features. Based on user feedback, we have now added further features to the Review Hub in codeBeamer's new version 8.2. Learn more below. 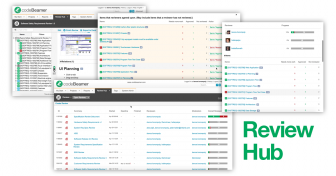 Essentially, the Review Hub allows you to set up reviews (assign a list of items such as requirements, test cases, documentation, etc to chosen reviewers), and to carefully track the process of reviewing using real-time data. Better still, starting with 8.2, you can now automate the whole process by simply embedding the review in your workflow. Send automatic notifications to all reviewers, and trigger status transitions once the review process is done. Rules may be simply applied to process of reviewing: you can require approval from all or some specific reviewers, or a certain number of positive reviews. Using the Review Hub, management sign-off via e-signatures can be made mandatory to complete the approvals process. You can even flexibly skip certain statuses so that your workflow progresses just the way your teams need it to. A full change history is offered on the whole process of reviewing, including comments. As the Review Hub provides full traceability, you can simply trace the implementation of reviewed work items through to testing with minimal effort. Efficient real-time monitoring lets you review all changes as well as the impacts of these changes conveniently. Review statistics may be easily exported to Excel for insightful reporting to help management decision-making and to simplify compliance audits. By enhancing your review processes, codeBeamer ALM's updated Review Hub helps you achieve better quality products with less errors during development. Automating the review process means a shorter time to market, while advanced reporting options are a treat for auditors aiming to ensure the use of mature processes throughout development. Overall, the Review Hub is a valuable addition to codeBeamer's wide range of features, as it simplifies the management of even the most sophisticated review & approval processes. By providing better monitoring, control, and reporting over review processes, it's a crucial tool for development teams operating in highly regulated industries such as the development of medical devices, pharmaceutical products, automotive and avionics embedded systems, and more. To better understand the benefits codeBeamer ALM 8.2 and its Review Hub can bring your team, start your free 30-day trial today, or contact us for a 1-on-1 demo!